I am going to use glyphosate to kill the grass prior to making new flower beds. Is it advisable to create some sort of barrier between the lawn and the new bed or is this not necessary? 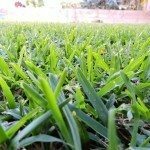 While you can certainly use glyphosate to kill your grass to prepare a flower bed, there are other non-chemical means you can explore also, which are discussed in the article link below - these natural methods would eliminate your concern of glyphosate drift onto other areas of your lawn. It would be advisable to spread newspaper over the adjoining areas while you are spraying glyphosate just to afford it some protection.